A 72-year-old Vietnamese man has dedicated most of his life to building houses for poor strangers instead of fixing his own dilapidated home. Vo Van Mum’s house is not much to brag about. Its walls are fortified by little more than memories of love and joy, collected over decades of raising seven children in the leaky cottage. A little bit of money could go a long way for Mum, aka Hai Mum. There are repairs the house has needed for years. But for Hai Mum, this little piece of land in the Mekong Delta province of Tien Giang is just fine. After all, why would he spend the little money he has fixing his own house when he can put it toward ensuring those around him have a place to call home too? Rather than enjoy a peaceful retirement, the 72-year-old man spends his days volunteering to build charity bridges, fundraising, and rowing along a local river to scoop up old bottles from the water to sell to local scrap dealers in the hope of earning enough money, not to lift his own family out of poverty, but to buy materials to build homes for others. 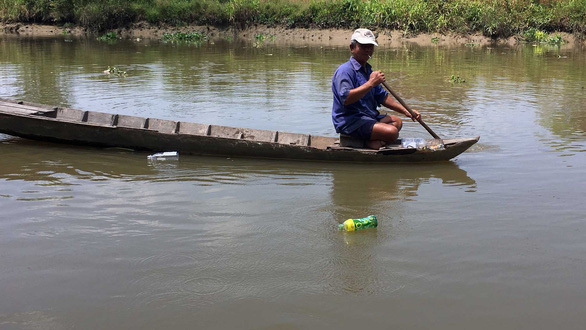 The scorching sun over the Co Co River does not stop Hai Mum from jumping in his old wooden boat to collect bottles and wood from its waters. The old man’s days are spent sitting atop the roof of his house overlooking the river, scanning the tide for anything he can grab to trade or sell to scrap dealers. On some days, his haul weighs in at a whopping 15 to 18 kilograms. “Though scrap dealers normally pay VND3,000 [US$0.13] per kilogram, they give me VND5,000 [$0.22] per kilogram because they know the money goes to charity,” Hai Mum said. Each dong he earns is spent on rice for poor families or fixing dilapidated houses in the community. “On my lucky days I find drifting wood logs, some of which sell for VND130,000-200,000 [$5.6 - 8.6], depending on their type,” he shared, adding that he is able to earn a few hundred thousand dong each month from selling scrap. Pham Tuan Minh, another local resident, is just one of the hundreds of people who have benefited from Hai Mum’s dedication to helping those in need. The two had been strangers until a friend told Hai Mum of Minh’s run-down home and difficult financial situation. “We needed VND40-50 million [$1,700-2,200] to build a new house and Hai Mum raised just enough to make sure we could do it,” Minh said. For Hai Mum, helping others is a way of life, regardless of the difficulties his own family has faced over the years. With seven children and no farmland, it is a wonder that not only was he able to raise a family, but his now-adult children refused to let poverty distract them from education and landing stable jobs. “I remember when our seventh child was in grade 9 he didn’t even have clothes to wear, so I had to ask a neighbor to share with us,” Tran Thi Minh, Hai Mum’s wife, recalled. To help ease the family’s burden, local authorities classified the household as ‘poor’ in order to make them eligible for a government allowance. Hai Mum’s employer also gave him a small piece of riverside land to build a house. “That’s why I am repaying the local authorities now,” Hai Mum explained. However, helping build houses is not the only way he helps others. Last year, for instance, the old man collected over 500 kilograms of rice for the poor, while soliciting enough money to cover the funeral and burial for several members of the local community. In 2008, Hai Mum worked as a volunteer to collect medical plants in the mountains for a charity clinic which treats needy patients who are unable to afford nearby hospitals. The job required him to walk hundreds of kilometers over several days in order to find the plants. After 6.5 years of helping the clinic, the family moved to another village so he started volunteering in building charity bridges. Despite his age, Hai Mum made sure to be at the construction site from dawn till dusk. When the construction of the bridges in the area was completed, he began to travel further out to ensure residents in more rural areas had bridges as well. 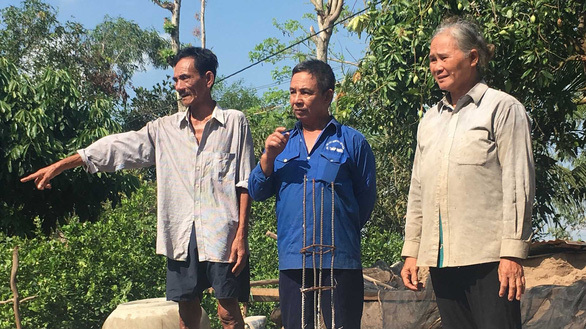 In 2015, as Hai Mum noticed all the wasted steel and building materials left after the completion of a new bridge, he collected all the ‘leftovers’ and used them to fortify the damaged pillars and roofs of several poor households. “I am very lucky,” Hai Mum said, acknowledging the support he receives from his wife. “Every time our children send us money, I put VND1 million [$43] to VND2 million [$86] aside in case someone needs help,” Minh, his wife, said. “We do not have a cent of savings because every time we get some cash, we give it to those in need,” she added.